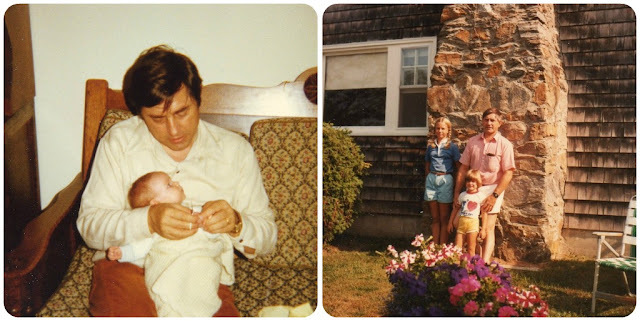 I always wished that I'd inherited my dad's jet black hair and piercing blue eyes. He was incredibly handsome, and of course, there was the quintessential French accent...which, as a child, I didn't fully appreciate. A lot of people had a difficult time understanding him, so when I was little, I would try to explain that he sounded like the only famous person I knew with an accent, Arnold Schwarzenegger. That didn't really help. Now I wish that along with the hair and eyes, I had my own charming accent. Thankfully, I did inherit my dad's love of food and spending time in the kitchen. The bars are so rich, that they will make you feel like a millionaire. 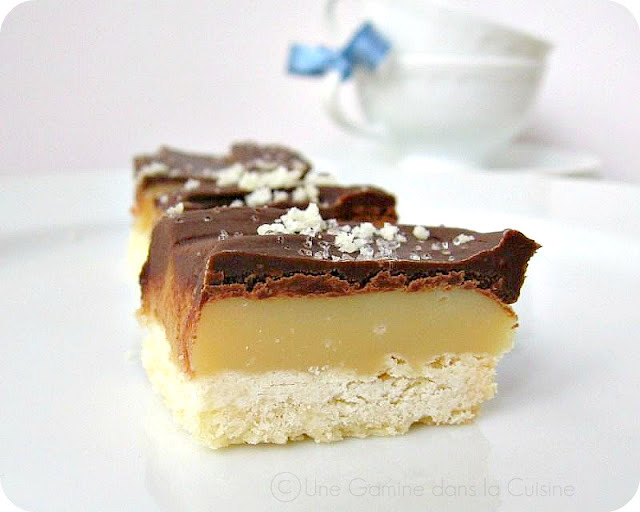 The base is a buttery shortbread, the filling is an equally buttery, creamy dulce de leche which is then covered with melted dark chocolate and salt. If candy bars are reincarnated, this is what they wish to return as. Joyeuse (un petit peu tard) fête des pères. Preheat the oven to 350F. Line an 8x8 inch square baking pan with foil and butter or spray the entire pan (bottom and sides.) Set aside. Crust: In a medium bowl, beat the butter on high speed until it becomes light and fluffy (about 3 minutes or so.) On low speed, add the flour, salt and sugar and mix just until a crumbly dough forms. Try not to over mix. Press the dough into the prepared pan, going up the sides a bit. Prick the dough a few times with a fork. Bake for 15-18 minutes or until the crust is just starting to turn a light gold. Remove from the oven and cool completely. You may turn off the oven at this point since you won't need it again. Immediately pour the mixture over the cooled crust and spread it evenly before it hardens. It should be easy to spread as long as you don't hesitate too long. Set the bars aside to cool for about 20 minutes. Chocolate topping: Place a heatproof bowl over a pot of simmering water. Make sure no steam is escaping from the pot. Place the chopped chocolate and butter into the bowl and stir until you have a smooth, shiny mixture. Carefully remove from heat and drizzle the chocolate over the cooled dulce de leche layer. Sprinkle some sea salt over the chocolate before it cools. Chill the bars completely before serving. To cut the bars, run a sharp knife under hot water. Run the hot knife through the bars. Repeat as necessary. Mmmmm.... I love millionaires bars. A lovely post and tribute. Those bars look extremely devilish! I love your family photo. So cute! But I wished you'd put up a bigger picture of yourself - I could hardly see you! What a perfect treat for dads everywhere. They look wonderful. Holy goodness, those look amazingggggg! I've made a similar caramel bar before and I was in love! Definitely trying these out ASAP! Great post and absolutely gorgeous bars! Beautful! That layer of dulce du leche looks perfect. What a wonderful looking treat, and a lovely tribute to your Dad! I attempted to make these a few months ago and it was a huge fail... yours look amazing, though, and it might be time to try again! I love the old family photos! I recently put a couple of old pictures of my brother and I up, and my guests couldn't stop looking at them. They always bring a smile. Oh, and I had a tragic bowl cut too. 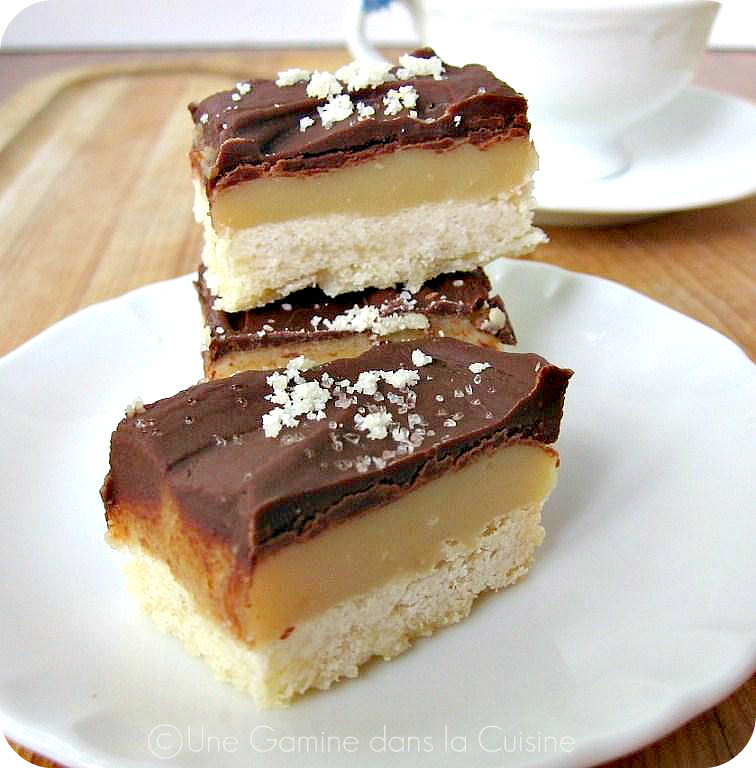 I ate a lot of millionaire's shortbread in Scotland, but haven't had it since. Must fix that soon! Love the flaky salt on top. Lovely post and these treats look amazing.